This top cost me £3. I made it by reclaiming three discarded men's shirts that were awaiting a new life in my local charity shop. .. and a collective challenge, laid down by Barley Massey and Tree from Stitchless TV. I had so much fun making it, was pushed out of my comfort zone and learned a lot a long the way. I may not have even finished it yet. I think those sleeves need to be shorter, maybe even chopped off at elbow length. The shirt is still evolving! When Barley asked me if I'd be a 'sewing doctor' at her drop in clinic at the Great British Sewing Bee Live I readily agreed. I enjoy helping and encouraging people to sew, and it also felt like a long time since I'd been part of a sewing meet-up. I had an urge to join a real world event that was a physical, communal celebration of this solo activity I practice. 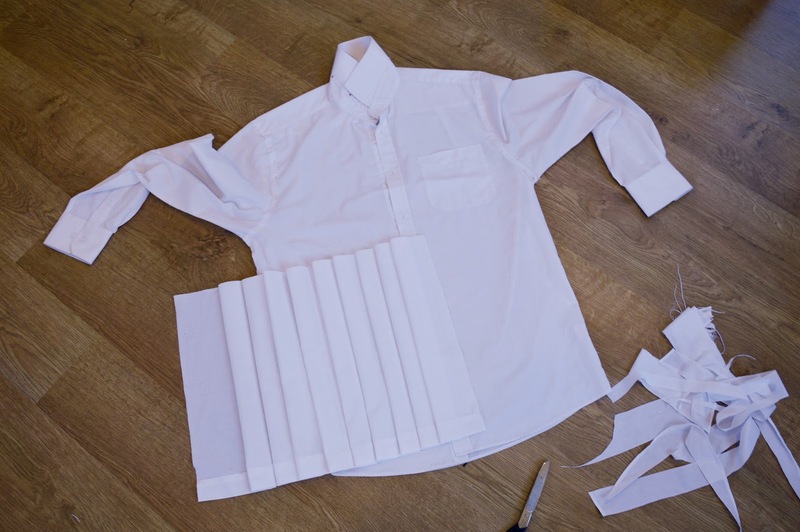 A couple of weeks before the event Barley asked if I fancied getting involved in an upcycling challenge to transform a men's shirt into something wearable in 45 minutes. 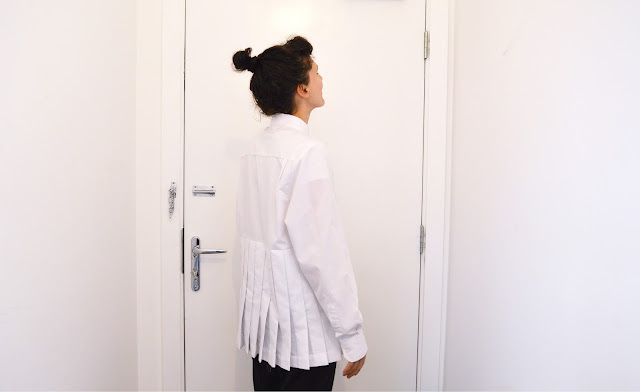 Upcycling or refashioning is not normally my thing (apart from this excursion into it last year as part of Portia's brilliant Refashioners project, which is happening again right now) but... I said yes. This summer I read Folk Fashion by Amy Twigger Holroyd. 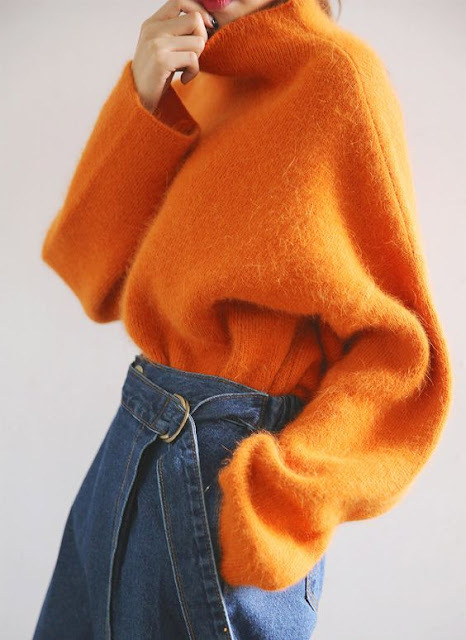 I'm in awe of this thoughtful investigation into what homemade clothing means, both for the maker/wearer and for our societies and their ongoing transformations. 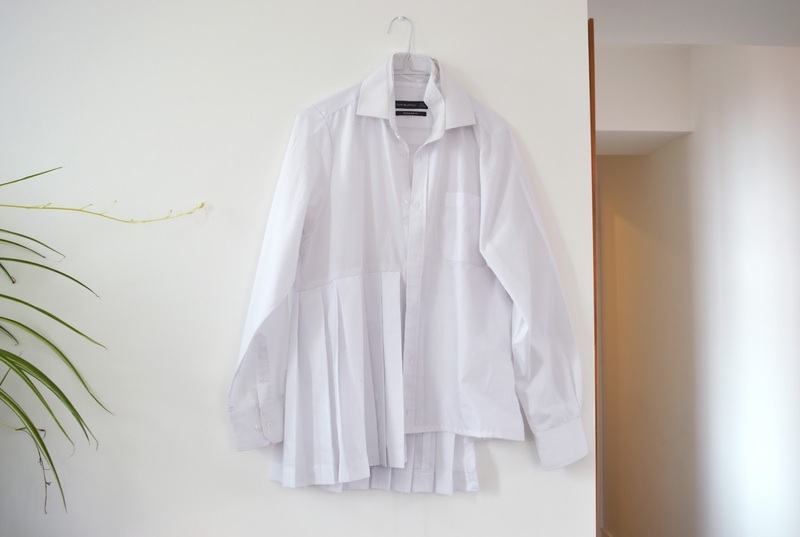 Towards the end of the book, Amy picks out five strategies she suggests we adopt when making clothes in order for our practice to delivery the greatest satisfaction and be most disruptive of the status quo. One of Amy's strategies is to 'spread your wings' and it's in the spirit of this strategy that I accepted Barley's challenge. I pretty much follow the cycle that goes buy fabric, cut fabric into pieces, stitch fabric together, wear fabric. I've always thought upcyclists very clever for working within the limitations of a premade garment and also admired the sentiment of reclamation, which boldly breathes life into something rejected as waste. 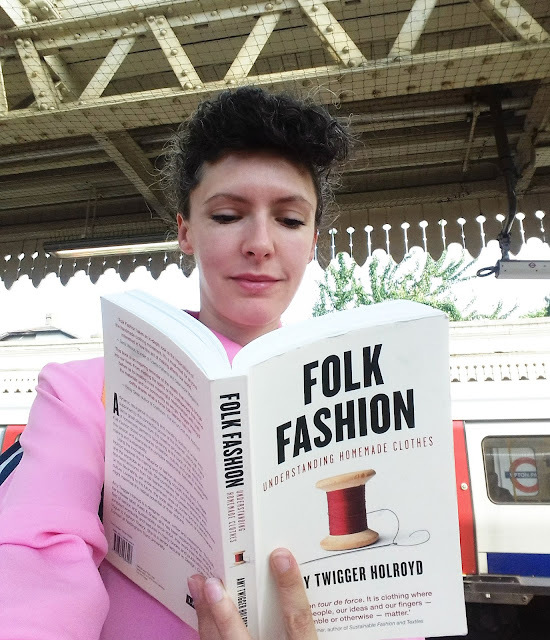 Amy weaves a lovely metaphore in her book of 'the fashion commons,' a wild field of clothing options in which we often tread the same path again and again. Amy suggests that making clothing is part of stepping off the path to explore new ground and break the laws of what's been done before. 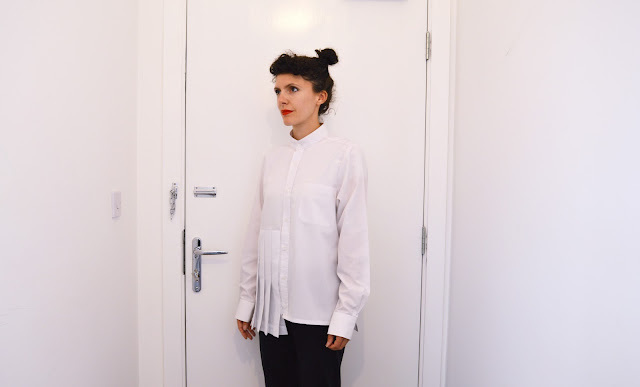 By spreading our wings she says we state "I choose to go beyond the normal habitat of homemade clothes, challenging enclosure my digging in the territories of industrial fashion." 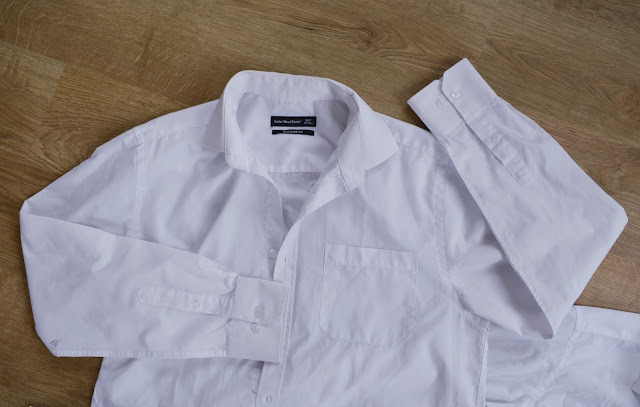 And what, if not digging in the territories of industrial fashion, would I be doing by cutting up a Cedarwood State Regular Fit shirt and turning it into something I could wear? This is the shirt that formed the basis of my transformation. I picked it because it has no darts at the back, no stains and I liked the shape of the patch pocket. 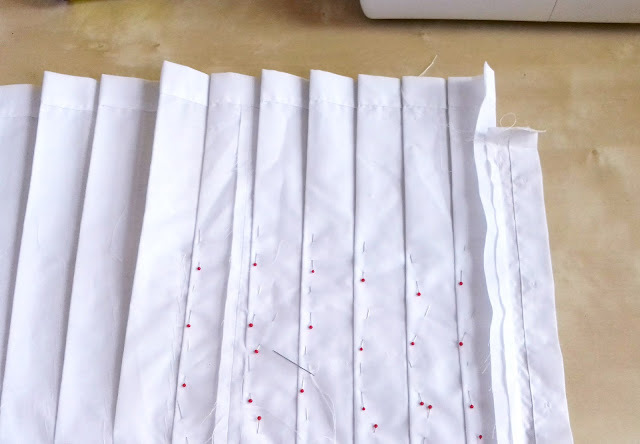 To maximise the use of the 45 minutes, I decided to harvest fabric from the other two shirts and make up a pleated section, so it was ready to insert during the challenge. 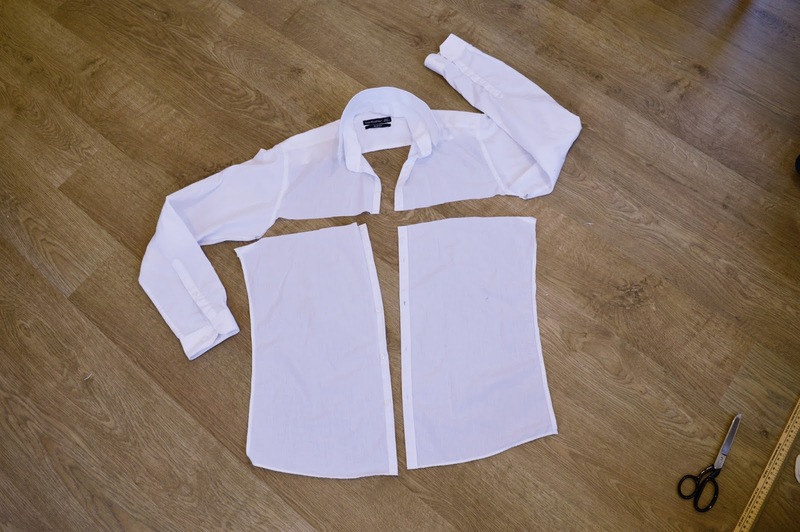 I cut the backs off the remaining two shirts entirely and unpicked the waist darts that were giving them a slightly fitted shape. This opened up two nice unblemished expanses of fabric. I marked out and cut the biggest rectangles I could from the back of each shirt, joined them together and hemmed the bottom of one of the long edges, then I pleated it up (fairly roughly - no measuring or tools involved), pressed it and laid it out on the base shirt. It barely covered the front quarter of the shirt. I was thinking I needed to squeeze in another trip to the charity shop to buy more shirts (it's next to a mosque where everyone wears white on a Friday so there is no short supply of white men's shirts!) when I realised I could use the fronts of my existing shirts. I chopped them off and marked out three rectangles (I had to abandon one of the sections as it had red paint spots on it). 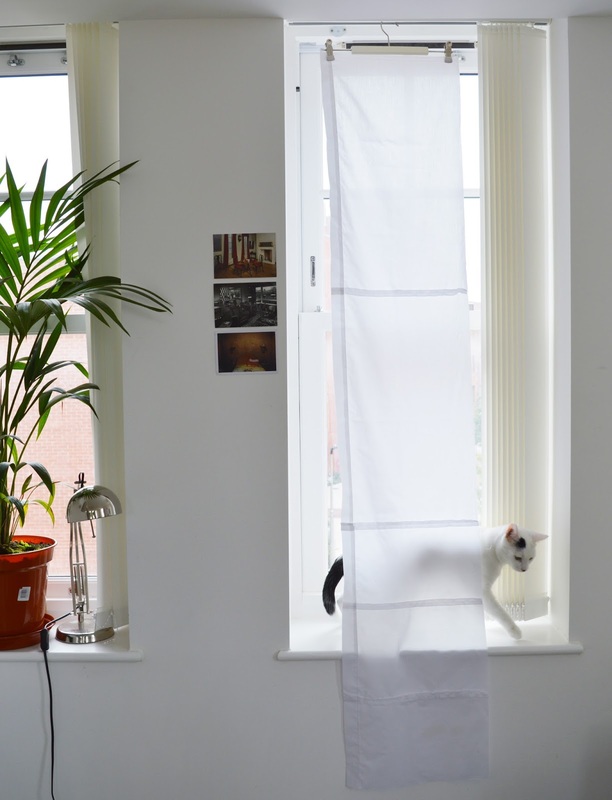 When I sewed them all together, the strip I had created was 1 metre 85cm long. I wrote out step-by-step instructions for myself (yes, I am a loser) as I knew time would be tight and I didn't want to have to waste precious seconds thinking about about what moves to execute. I don't have any photos of the actual challenge as the time pressure was enormous, but I took this sneaky fangirl shot of me and Emily of Self Assembly Required right afterwards. I didn't come close to executing my entire plan but managed to take off the sleeves, trim away width at each shoulder and reattached sleeves (this all took ages and the result was very not dramatic) and insert the pleated panel. I wasn't happy with the balance between the back and front of the pleated section. You can see in this photo that the bottom edge of it is significantly higher at the centre front of the shirt, sloping downwards to the side and much lower across the back. Another one of Amy's strategies in Folk Fashion is to enjoy the journey. 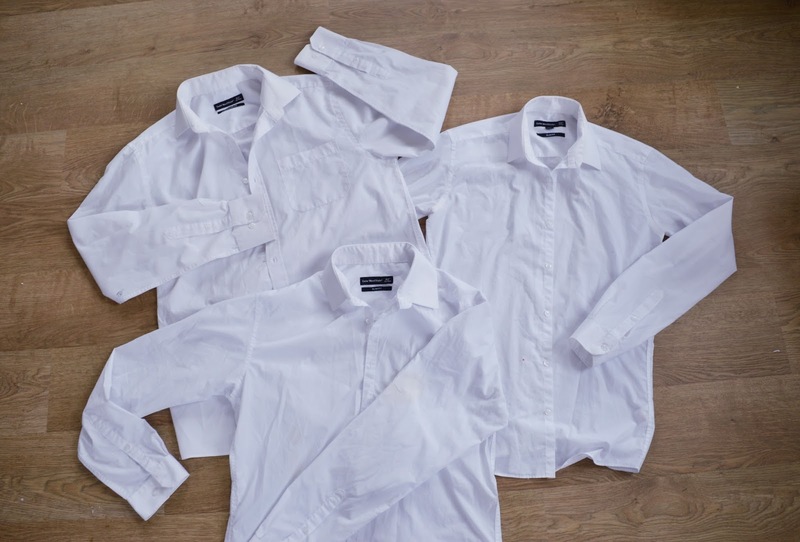 Whereas industrial production emphasises efficiency, homemade clothing embraces the opposite. Amy states, "If I really want to challenge the paradigm of overconsumption, I need to embrace the journey of making, with all of its twists and turns"
With that in mind, I decided to spend time turning the shirt into something I really would wear. I think of its creation as having three phases - two hours of prep and planning, forty-five minutes high pressure destruction/construction, five hours of refashioning and refining (pretty sure there is going to be a phase four as well). Back at home I totally unpicked the pleated panel, recut the cut-away in the shirt, shaping the upper edge of it so that it sloped up towards the back, then sewed the section back in. Most of my time was spent on a lot of hand sewing aimed at getting the pleats to look controlled rather than wild. I also unpicked the collar stand, extracted the collar and sewed the stand back together. Here is the result. What are my neighbours doing? 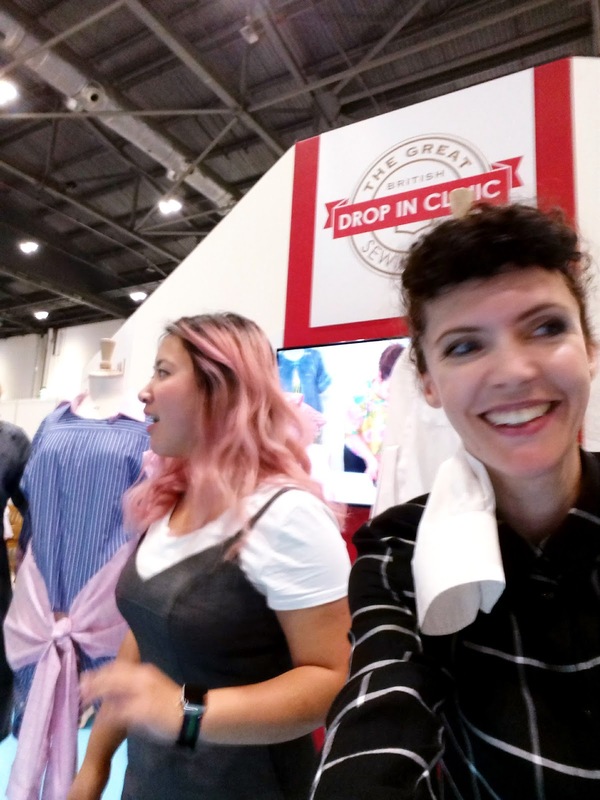 Before the Great British Sewing Bee Live, a fellow sewist and I were messaging about what we thought it would be like and whether it would be 'worth' going. For me, a large exhibition where shops and customers get together in one huge physical place seemed possibly outdated. Us sewists commune almost everyday in the digital world, where we 'meet' and inspire one another. As a business model, I'm not sure how many years big retail exhibitions have left. But of course the event is more than just a retail space. 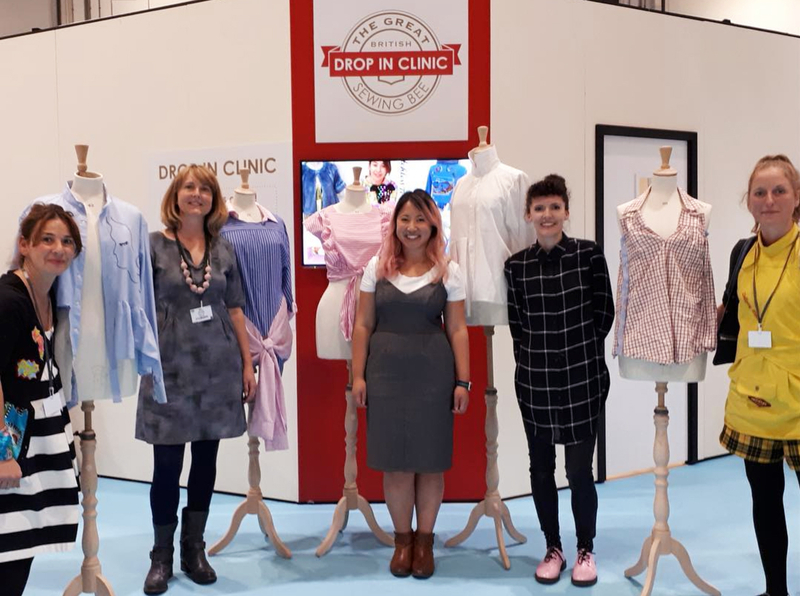 Many brands there are created and run by passionate sewists and there was a full workshop programme supporting people to learn and have fun, as well as catwalk shows that brought paper patterns to life. It was a place to meet and mingle and be inspired and it really had a great buzz about it. 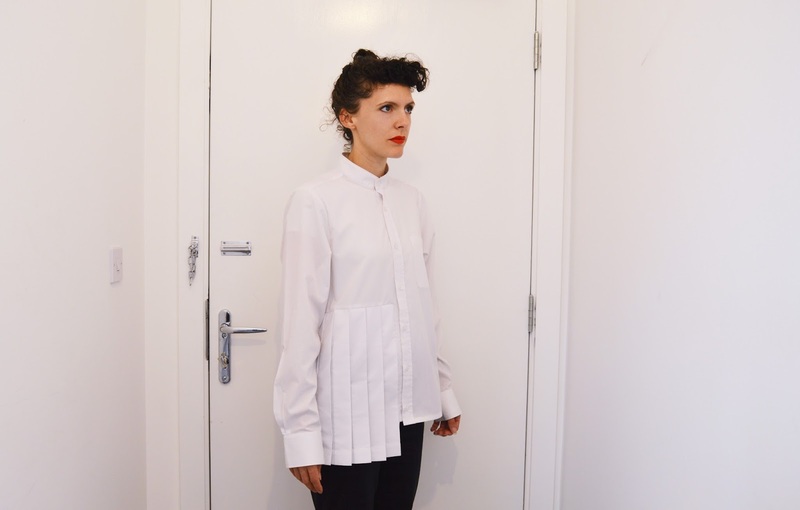 In Folk Fashion, Amy draws out the benefit of community, in terms of moral support, learning and validating our makes. It was my need to meet up with new and familiar faces and have sewists as my real world companions that drove me to the Sewing Bee Live and I'm so glad I went. But the show isn't over and my need is apparently not yet satisfied! I'm going to the Knitting & Stitching Show! 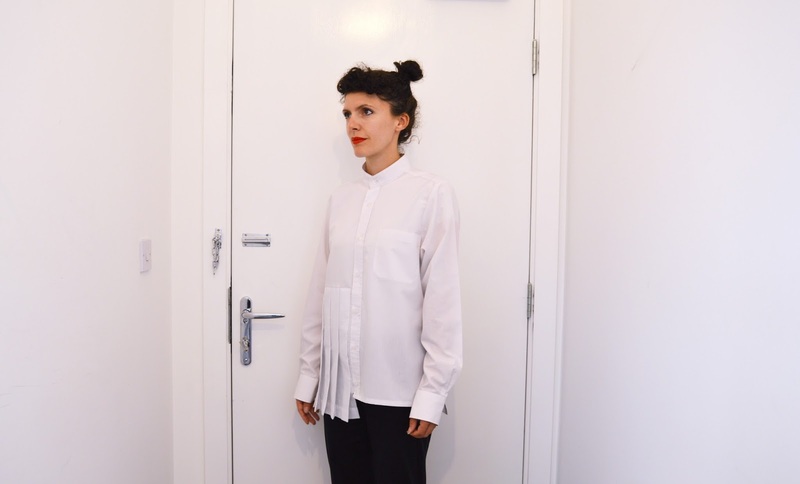 I've been sewing my own clothes for around 20 years (what the...?) but have never once picked up a pair of knitting needles, so in the spirit of spreading my wings, I think it's time to change that. I'm going to take part in one of the UK Hand Knitting Association's workshops there and wander further into the folk fashion commons. I see myself knitting something like this, though in reality I suppose there is a lot of failure on my knitting horizon. The Knitting & Stitching Show have very kindly given me 5 pairs of free tickets to give away. You can use them on any day except the Saturday of the show. If you'd like to win just comment under this post - perhaps you can share your thoughts on what value you see (or not) in big sewing shows or sewing meet ups. I'll pick the winners randomly on Friday October 6th at 1pm. I also have a discount code that you can use if you don't win the tickets but want to buy some. It's DIY17 and will give you a £2.50 discount on advance adult tickets or £1 on concessions (so tickets will be £12 instead of £14.50/£13). One of my favourite elements of the Knitting & Stitching Show is their focus on textile arts. This year I am thrilled that Amy Twigger Holroyd herself has an exhibition as part of the show. What a treat. I can't wait to go and wave my copy of her book in her face and demand that she signs it! I'm also looking forward to bumping into fellow sewists that I see on the internet and generally being inspired by throngs of sewing enthusiasts, young and ancient. Bring on the show! 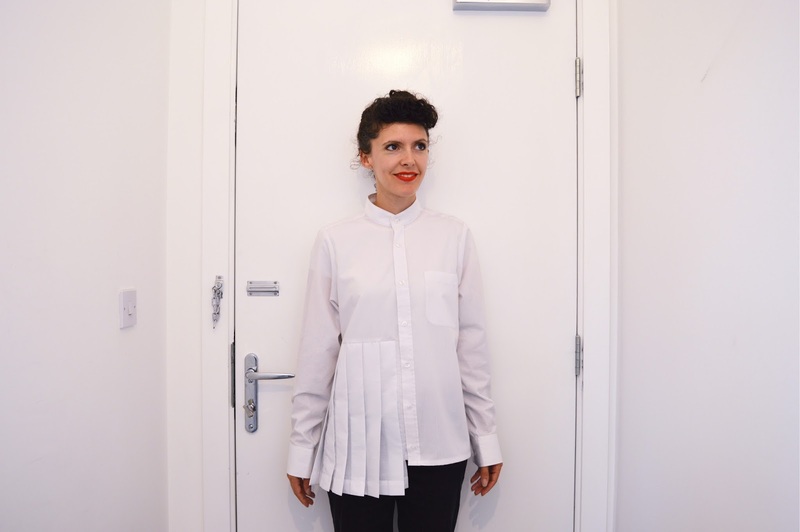 I was there towards the end of the shirt refashioning challenge and it was brilliant!!! You were all so creative and inspiring! I'd love a chance to get to the Knitting and Stitching show. It's great to meet up with people who I only know from the Internet, to tell bloggers and vloggers how much I appreciate their work, and have the chance to be sociable about something that's usually a pretty solitary pursuit. Hello! You've won a pair of tickets so do email me your home address so the Knitting & Stitching Show people can post them to you! Great inspiration for my husbands old shirts! Love the crisp pleating.... I'd love to go to K&S as for me it's a chance to see other sewists. I missed the GBSB so it would be great to get in on the K&S action! Great shirt. I've also had mixed feelings about sewing exhibitions but have heard good things about the knitting and stitching show. I'd love to go and attend a beginning knitting workshop as I've been sewing since I was a child. Hello! You've won a pair of tickets so do email me your home address so the Knitting & Stitching Show people can post you your tickets! Gods bless you for this wonderful post, full of important thoughts and, as it is always the case with you, full of inspiration. I come through your words in perfect timing. Thanks so much, really. Enjoy the show! And the knitting too. School of needlework at last show I visited. The shopping stalls are often the least interesting part! 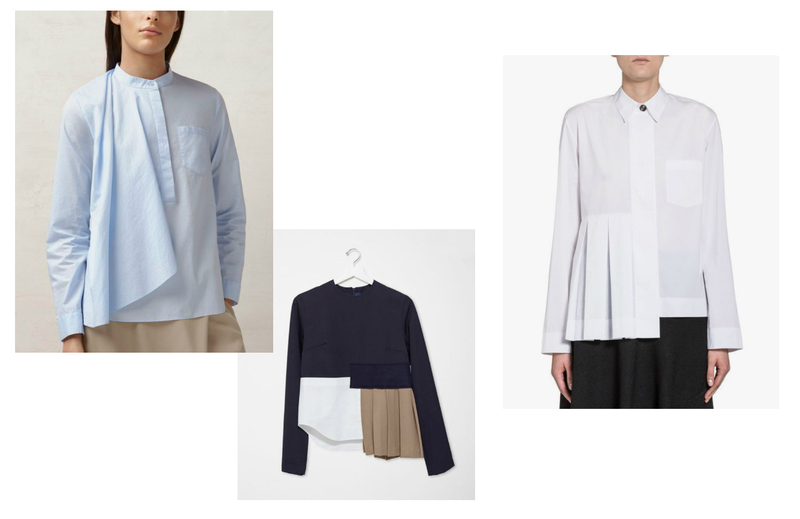 Love the pleats in your shirt, all the fabric controlled into one place. The knitting and stitching show at Alexandra Palace packs so much in! Inspirational work, an incredible choice of beautiful fabrics all under one roof, and the chance to test out some amazing sewing machines, it’s a sewers heaven! And even if you don’t go with a meetup or group, sit down anywhere for a rest and you’ll strike up a conversation about sewing. I would love to win tickets, but will be there whatever!